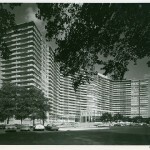 The Parkway House at 22nd and Pennsylvania Avenue was designed by the firm of Roth & Fleisher in 1953. Elizabeth Fleisher was one of the first female architects to practice in Philadelphia– her partnership with Gabriel Roth produced a number of commercial and apartment buildings, of which the Parkway House is the best known. Nearby at 24th and Pennsylvania Avenue, the Philadelphian is the work of architect Samuel Oshiver, known as the “high priest of the high-rise.” He built large apartment buildings across the city, including two on Rittenhouse Square. The Philadelphian, with its monumental terraces and undulating facades, is perhaps his most compelling design. The extraordinary “ordinariness” of Robert Venturi’s Guild House (1960-63; 711 Spring Garden Street) is the stuff of art-historical legend. Recently restored by Venturi, Scott Brown and Associates for its original owners, the building was constructed as senior apartments by the Friends Neighborhood Guild. Once crowned by a ornamental golden television antenna, the building reintroduced symbolism and vernacular sympathies to a generation of architecture scrubbed clean by the International Style. Casa Fermi, now known as Casa Farnesi, was one of the nation’s first assisted-living senior high rises when it was built at 13th and Lombard Street in 1962. It was designed by Stonorov & Haws– Oskar Stonorov was a German-born Philadelphia architect responsible for a number of influential projects, including the Carl Mackley Homes and the Hopkinson House. Also a sculptor, Stonorov included a cubist installation that survives in the lobby of this Washington Square West high rise. Aaron Colish was a Philadelphia-born University of Pennsylvania graduate and protoge of Paul Phillipe Cret, assisting the later in the design of such interwar icons as the Benjamin Franklin Bridge and the 2601 Parkway Apartments. His Windsor Apartments along the Benjamin Franklin Parkway, built 1962-65, is one of the boulevard’s most recognizable, if not appreciated, designs. I.M. Pei’s Society Hill Towers were the winning entry in a design competition meant to anchor Planning Commissioner Ed Bacon’s plan for a transformed and renewed Society Hill. Pei was a relatively unknown architect at the time; both his design and Bacon’s vision have proven wildly successful. Integrating a distinctly modern aesthetic and conspicuous scale within a tight-knit historic context (the towers rise 31 stories above a neighborhood defined by nineteenth-century rowhouses), the project was completed in 1964. The polls are now closed. View the final results below!